David Leonard will be taking over from award winning Bertie Carvel to play the child-tormenting headmistress Miss Trunchbull in Matilda the Musical at the Cambridge Theatre from 3rd July. Carvel leaves the production on the 1st. Annette McLaughlin will take over from Josie Walker as Mrs Wormwood on 21st August. Walker leaves on the 19th. They will be joining new cast members Steve Furst and Haley Flaherty who play Mr Wormwood and Miss Honey and two new Matildas: Isobelle Molloy and Jade Marner. 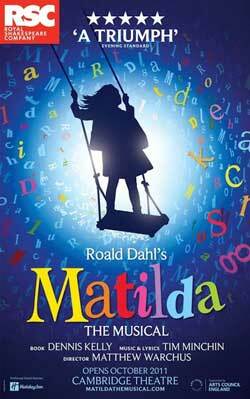 Hayley Canham will be joining the company as Matilda in August.